Almost one third of our electricity needs can be met by a predictable, renewable and yet largely untapped resource: ocean waves. Generated by wind blowing over ocean waters, ocean waves travel large distances with little loss of energy. As such, they are a renewable resource that is more consistent and predictable than wind or solar generation. Our research team at Lehigh University is examining how to design, operate and maintain future wave energy farms by using digital technologies to integrate them smoothly to the electric grid. Wave farms contain arrays of wave energy converters (WECs), devices that convert the energy in rolling ocean waves to electricity. Smart wave farms also include energy storage such as batteries, sensors, communications capabilities, computational resources, and electronics to deliver electricity to an on-shore grid connection point. All these components, as well as the algorithms that control them, together describe the cyber-physical infrastructure of the wave farm. Our team, which has people with a background in everything from wireless data communications to fluid dynamics, is determining how to optimally deploy and operate this infrastructure. We are exploiting the predictability of ocean waves to aid people who operate wave farms and to optimize farm production. We are also deeply interested in the sustainability and market potential for future wave farms. Unlike other renewables that require fossil-fuel based generation to balance out their variations, consistent wave power will have lower CO2 emissions. We are evaluating this effect and are studying what profits wave power producers can expect in the electricity market. Estimates of economically recoverable wave energy along the US coasts range up to 1,170 terawatt-hours (Twh) per year using existing technology. Total electricity consumption in the US is approximately 4,000 TWh/year and coastal states use nearly 80% of the nation’s electricity. This means that the potential for clean, renewable wave power production in the US is very high. Ocean wave characteristics can be reliably predicted up to 48 hours in advance and waves are available 90% of the day on average, compared to 20-30% for wind and solar. This key benefit will provide wave power producers more lucrative market opportunities than are currently available to more variable renewables. These profits could also offset the high initial costs of installing wave farms. PowerBuoy from Ocean Power Technologies captures energy from waves. 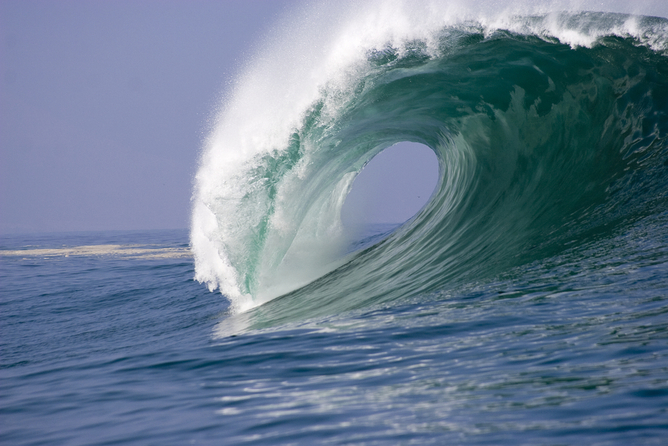 As an emerging industry, wave energy conversion faces other challenges. For example, more testing infrastructure is needed. But to do that, current regulatory and permitting procedures have to be updated for this technology. And the environmental impact of withdrawing large amounts of wave energy must be studied further. Over the past two decades, several types of WEC devices have been developed and deployed. There have been commercial-scale wave farms deployed in Australia and Europe, but none has been put online in the US. For ocean energy to scale up, we will need to fill some gaps in our knowledge. In the future, wave farms will not be a collection of individual generators. Instead, they will be a complex cyber-physical system and require interdisciplinary tools. We are interested in the wave farm as a system, and in its interactions with the ocean environment, the power grid, and the electricity market. We are exploring the predictability of waves using both in-ocean sensors as well as forecasting algorithms. The predictions can be used to adapt the WECs energy capture, or energy storage decisions. In our project, we are working on wave farm systems that blend tools from hydrodynamics as well as communications and computing. We will use sensors and controllers to predict power, optimize output and integrate with electricity markets. We will validate the economic and environmental feasibility of wave power and use our research and development to realize the potential of wave energy conversion at large scale. WECs in a farm will also interact with each other. Besides absorbing power from incoming waves, individual WECs reflect waves which will mix with incoming waves and impact how much energy can be captured at neighboring WECs, and vice versa. These interactions must be understood and accounted for in controlling the farm’s total output. This total power produced will in turn impact grid integration, emissions, and market interactions. 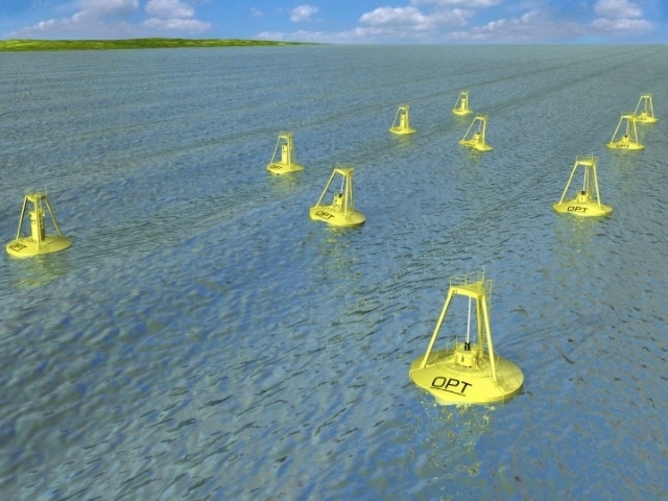 An artist’s rendition of a wave farm with several Ocean Power Technologies’ PowerBuoy wave energy converters. Image is used with permission from Ocean Power Technologies. The buoys are WECs collecting energy from undulating sea waves. To me, they resemble wireless antennas receiving sinusoidally varying electromagnetic signals. 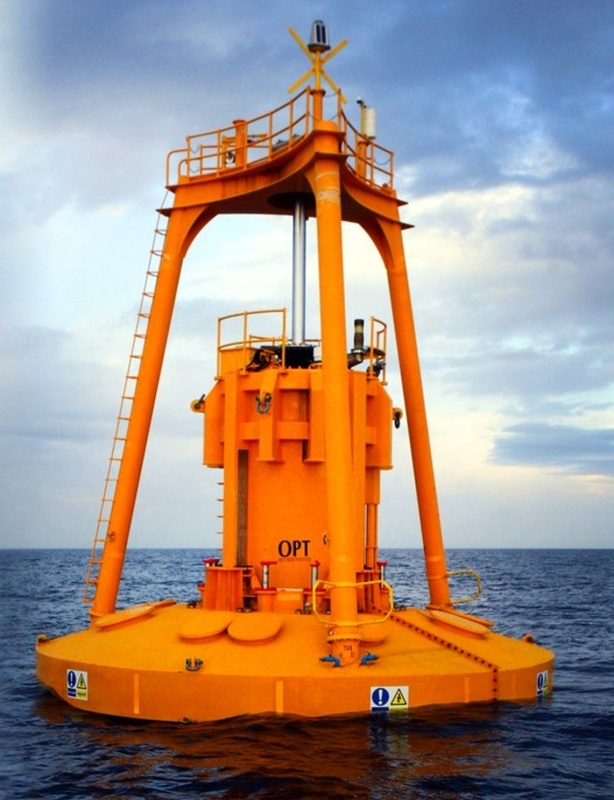 In both cases the buoys/antennas are placed in a field of waves to capture energy. The statistical variations of wireless radio signals and ocean waves are similarly captured. Significant performance gains in modern wireless communication systems have come from using multiple antenna systems. For wave energy to be successful at the grid-scale, we will also require multiple buoys, or wave farms. There are solid connections between a wave farm and a communication system scenario I have studied extensively in the past. Making these initial connections got my foot in the door and I have been making similar connections since. Besides powering the electricity grid, wave farms could also be used in powering a variety of off-shore applications. Our project team is interested in developing wave farm designs tailored for such energy needs. For example, we are interested in developing smaller scale wave farms that address the energy requirements for off-shore water desalination processes. In many parts of the world, groundwater is shrinking but sea water is prevalent. The presence of sea water may also imply availability of local wave energy resources that can feed water desalination systems. We are interested in developing cyber-physical infrastructure for such autonomous wave farms. The solutions may push forward water desalination technologies that could in turn help address the global water crisis.